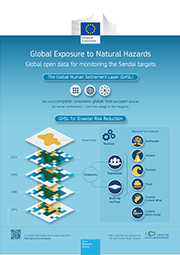 The Atlas of the Human Planet 2017 - Global Exposure to Natural Hazards summarizes the global multi-temporal analysis of exposure to six major natural hazards: earthquakes, volcanoes, tsunamis, floods, tropical cyclone winds, and sea level surge. The exposure focuses on human settlements assessed through two variables: the global built-up and the global resident population. The two datasets are generated within the Global Human Settlement Project of the Joint Research Centre. They represent the core dataset of the Atlas of the Human Planet 2016 which provides empirical evidence on urbanization trends and dynamics. 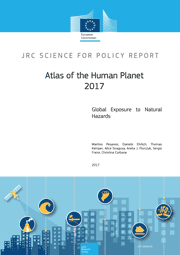 The figures presented in the Atlas of the Human Planet 2017 show that exposure to natural hazards doubled in the last 40 years, both for built-up area and population. Earthquake is the hazard that accounts for the highest number of people potentially exposed. Flood, the most frequent natural disaster, potentially affects more people in Asia (76.9% of the global population exposed) and Africa (12.2%) than in other regions. Tropical cyclone winds threaten 89 countries in the world and the population exposed to cyclones increased from 1 billion in 1975 up to 1.6 billion in 2015. The country most at risk to tsunamis is Japan, whose population is 4 times more exposed than China, the second country on the ranking. Sea level surge affects the countries across the tropical region and China has one of the largest increase of population over the last four decades (plus 200 million people from 1990 to 2015). The figures presented in the Atlas of the Human Planet are aggregate estimates at country level. 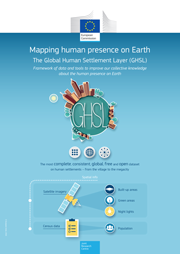 The value of the GHSL layers used to generate the figures in this Atlas of the Human Planet is that the data are available at fine scale and exposure and the rate of change in exposure can be computed for any area of the world. Researchers and policy makers are now allowed to aggregate exposure information at all geographical scale of analysis from the country level to the region, continent and global.